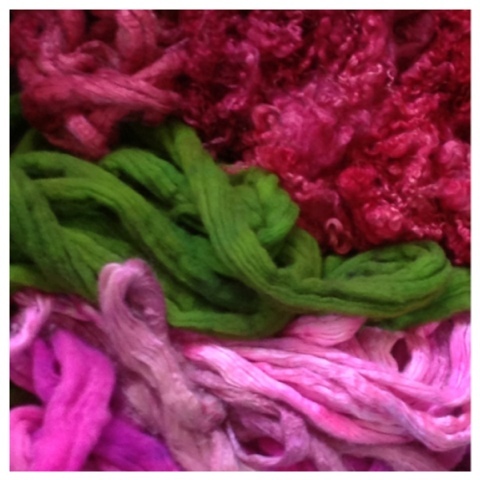 A little snap shot of some fiber I dyed up, there are three projects worth here, but I do like how they look together...hmmm, maybe I need to borrow a little from each spin and see what happens? Be sure to pop over and check out all the F.A.F. blogs at WonderWhyGal's, that's where I'm heading! I've pulled the Mostly Purple Scrumbled Bag, out to work on it a bit this week. Its fun to work up the individual elements and play with the composition of the bag. I definitely need to give project some more of my attention. I think I'll get out my book of crochet stitches and add a new stitch to my "crochet vocabulary." Be sure to pop over to see the WonderWhyGal and check out all this weeks FAF posts. I can hardly wait to see what you have all been working on! 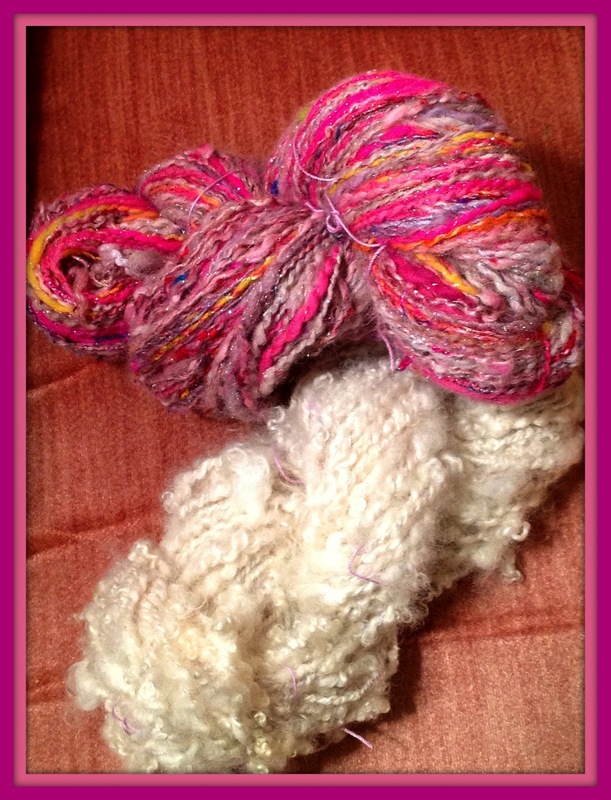 I've been scouring my studio, determined to spin much of my stash in readiness for the fiber lovers favorite season, spring shearing! So very, very long ago I bought a pound of roving, it's main recommendation was that it contained shredded denim fiber. This caused me to be blinded to the flaws of the roving as a whole...it happens. I've used bits of this roving carded in with other batts for texture and for the nice, dark denim color. I came across this in my stash, and found a small, partially filled bobbin. Good enough for me, I'll finish this spin, I thought. Wrong, the shredded denim fiber and color is the best thing about this fiber, otherwise it is quite coarse feeling, I hope it is only that the dye was not completely rinsed and that it will soften up when I wash the yarn to set the twist. Along with this, the other fibers blended with it are very short. After filling one small bobbin, I took the remaining roving and carded it with some super soft fibers that I had processed and dyed myself, some alpaca, merino, and finnsheep, plus gorgeous, luminescent rivers of pure white silk and of course angelina. It's spinning up beautifully. I am working on my second large bobbin, intending to ply this as a two ply. But what to do with the small bobbin spun from the original roving? I think I will first reel off a small hank and wash it to see how/if it improves the hand of the fiber. If it has softened up enough to feel, close to the skin soft, I will dye some silk to thread ply it as a balanced two ply. If not, I may have to pair it with a super soft single to compensate for any roughness. Either way, it will make a nice companion yarn for my current, uber soft spin, presently in the works. I can hardly wait to read what you have all been working on this week! It feels so good to catch up. Catch up with good friends, catch up on the "to do" list, and catch up on some creative time. So, let me ask you, how soft does that curly white skein look? It's SO soft! This yarn is spun from the wee tiniest locks saved from a Wensleydale cross lamb fleece. 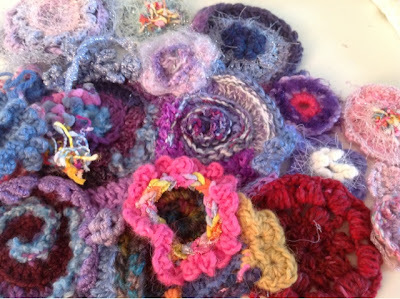 I set aside these little treasures, way smaller than the rest of the fleece, with a reminder note in the bag...MINE! I decided to try lock spinning them, they were so dinky I wasn't sure it would work. I'm so glad it did. It's a sweet, soft little skein and I will save it for something special. The other, whoo-boy, it has everything I love! All my favorite fibers in all my favorite colors. I'm calling this one, little surprise. 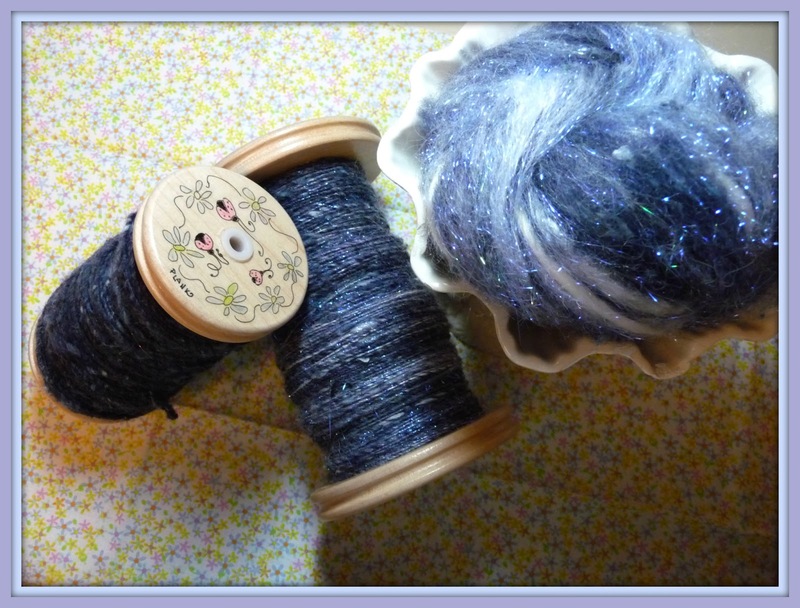 I had gathered all these really delicious fibers to do a tribute spin for the wonderful fiber artist Janice Rosema, who passed away not to long ago. If you are unfamiliar with her work, you should definitely check her out, she did some amazing work! Her fascinating blog can be found here, or her many projects on Ravelry, I had envisioned spinning a generous, bulky art yarn, with all the colors and textures suited to her amazing body of work. But the fiber seemed to just fit itself perfectly into a fine, compact strand, a little surprise of color and texture, silk, angora, alpaca, bfl, bamboo, sari silk, silk noil and of course lots of sparkle. I really loved the color runs and so I plied it with a pretty, multi colored lurex thread I bought from the UK. It gives me happy eyes! I think I may save this and tuck it into the stash I've set aside for when I get a loom...we'll see. I hope you have had a wonderful, creative week, I'll be popping off now to check out your projects too! Thanks for stopping by, Blessings Friends! I have decided that today is a good day to stay put. I had planned to do some running around, but it has been a morning of toppled furniture, spilled paper from the shredder and among other things, I walloped the lamp hanging over the table...so you can see why I might think twice about hitting the roads! I have been busy friends, it's just that I have not been posting about anything because the stuff I am working on seems like it is taking forever and updating you all would be the equivalent (literally in some cases) of watching paint dry. zzzzzzzzzz, I just couldn't do that to you! I do have snapshots of some of my projects for you...evidence that I have been busy. I've started a lap blanket for my mum, plus plans and yarn for two more. This is good tv knitting, and the lap size is not too cumbersome for on the go knitting. 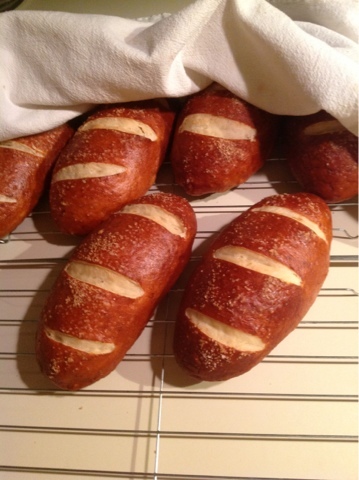 is portioned to make 12 batard or boule, but the next time I will try making them smaller, more like dinner roll size. The little loaves worked out great though, I wrapped each one in parchment paper before bagging them for the freezer. I used my food saver, to seal them, being careful to remove only enough of the air to draw the bag gently snug, before sealing it closed. 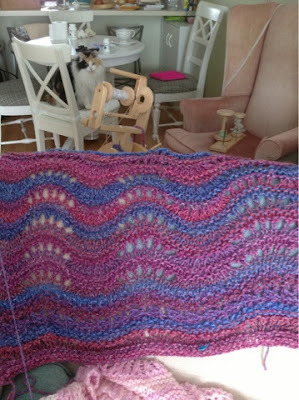 In the background of the afghan picture, you can see my spinning wheel, I brought it up to finish up some spinning I had started quite awhile ago. I finished it up last night, so today I will do some plying. Have a wonderful weekend, blessings friends!